The graphic shows 3 different shields for USDA Choice: red and blue, red, and white. Is there a significant to the different colors? I notice some supermarkets do not label which USDA grade(s)of beef they sell. Fred Meyer prewraped beef is unlabeled Select grade. They have a special butcher attended counter where prominently labeled Choice grade beef is sold. Most shoppers probably wrongly assume the prewrapped meat is also Choice grade. Interestly, another Kroger company, QFC, sells only Choice grade meat which they proudly advertise to be the case. Another gimmick used by some markets is to avoid revealing to the consumer what FDA grade of meat they sell by attaching a catchy name to their beef cuts, for example Angus. I doubt most consumers know that Angus is the most common breed of beef cow, not a meat grade. It can be consumer beware out there. If a market is using the USDA Choice emblem in their newspaper advertising in relation to certain cuts of beef that are on sale that week but the beef they are selling is actually un-graded or select, are any laws being violated? Should this be reported? Are there any consequences for the store? For the conspiracy-concerned: Why not worry about processed foods (basically anything bought in the store that is pre-made and packaged) and the harm they are doing to the waist lines and health of Americans before nit-picking about antibiotics in beef.... unless that's your thing: to dip Oreo cookies in your organic milk. Why do you assume that all beef labeled USDA is raised the same way? Conversely, how do I know the quality of grass fed beef sold at the local farmers market? Some of that meat is very tough and tasteless. Not all mind you, but I have no way to know. Buyer beware. Hi, does anyone know exactly which are the fat values of each of the marbling grades? I buy Prime brisket at Costco, but the quality seems inconsistent. Sometimes the brisket appears to be from an older steer. The fat is hard, thick and white. Whereas the better ones are softer, not so thick, and more interspersed and yellowish. Why is this? Who inspects Costco's beef supply? The grade USDA " Good" has been removed from your list a few years ago. It was often called the third best. A discount food store weekly sales flyer advertises USDA T-bone steaks. When you try to buy the T-bone steaks you are met with a label: "product of Mexico" and USDA shield is no where to be found. Is this a legal practice, or false advertising? If the later, who do I contact? My wife has diabetes and her doctor tells her not to eat any fat. We have found a breed called American Blue that has no fat and claims to be more tender because of the finer and shorter muscle fibers, as well as having less colesterol than chicken . How can your antiquated grading system grade the health benefits of a breed like this. go to americanbluecattle.org and click on why American blue. @Steve - thanks for the comment. If you are looking for USDA graded product, make sure to always look for the shield or words like "USDA Choice" on the package. Please email the name and location of the store, and we can look into this further. You can email information to <a href="mailto:QAD.SupportService@ams.usda.gov&quot; rel="nofollow">QAD.SupportService@ams.usda.gov</a>. @Ken - thanks for the comment. 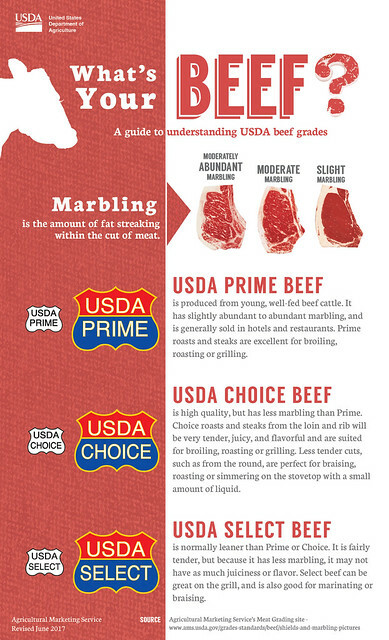 The beef grading system applies a uniform grade standard to any breed based on the amount of marbling in the ribeye along with the maturity of the carcass. The marbling is related to the tenderness of the meat, with more marbling and a higher grade being more tender and flavorful. Our grading system does not address health factors or nutritional values. What to do if the store is selling select (or less) grade and labeling in choice? What to do if the store is selling select (or less) grade and labeling it choice? Can retailers, restaurants or other end users use the stamp (USDA Prime, Choice, etc) on their menu or other new packages after the products are further processed? @Cleo Fu - thanks for the comment. Retailers, restaurants and other end users can use the USDA shields on their menu as long as the menu item came from a graded product (USDA Prime, Choice, Select). Seems like a bunch of jerks complaining about the beef grading. It is not the government that decides what you eat, at least not now. The grading gives a person a way of knowing what to buy for their personnel preference. Unless you are very rich you can't eat Prime + very often anyway. I Prime+ steak or rib roast is a wonderful tasting meal, one every so often is no big deal with your health. Some exercise would probably help you more than missing this occasional treat. Corn is as natural as grass and cattle actually prefer it.Enjoy your tasteless grass fed steak with a side order of corn..hmmm. A local Texas City, TX store (Food King) advertises in their weekly circular and on each package of Beef: "USDA Heavy Beef". There is no certification label on the package. However, the beef is tough and rather tasteless -- not what the label name would imply. Is there a grade "USDA Heavy Beef"? If not who do I report this to so USDA can stop this store's deceptive trade practices. This has been going on for the last six years I have lived here. Another grocer, H.E.B., does carry their "Prime 1" beef with the USDA prime grade seal and it is buttery and tender as prime grade should be. Are there prime and choice cuts on the same animal, or does prime come from a different animal entirely? If "prime" is sold in restaurants then why can't I get a good steak ANYWHERE anymore!??! I have stopped ordering steaks at restaurants altogether because they're always tough and dry and the fat is like chewing rawhide. I always order rare or medium rare so my experience with steaks has nothing to do with overcooking. Where do I report a market not properly marking a beef grade? How do I report a market not properly marking their meat grades? @Dennis Hanks - USDA grades about 96% of the carcasses from steers and heifers harvested at federally inspected meat processing plants, so there is a small percentage of beef carcasses that are not graded by USDA. Beef products from ungraded carcasses should not bear the USDA quality grade shield. For meat products that are derived from beef carcasses that are graded but the products are mislabeled, enforcement actions can be taken by USDA under authority provided by law. Information about meat products that are believed to not be properly labeled can be submitted to AskLPS@ams.usda.gov, and we will investigate the matter. What do you do if you think your local grocery store is Miss grading Meats? I'm having trouble with the meats at my local grocery store. They label a steak USDA choice T-Bone and it is missing the meat on one side of the steak. They list pork as pork loin chops and they put pork loin chops on the top of the packaging and blade chops underneath. They advertise sales items but you have to buy the family pack. When you buy the family pack, they shingle the steaks, pork and the chicken putting the good cuts on top and lesser cuts on the bottom or shingle it so that you cannot see what you are buying to you open the package. They list beef as Choice when it has absolutely no marbling. It is a very large chain store. I am wondering if the USDA seal should look exactly how it is shown here, or what. The steaks we bought today had a seal outlined in gold, seal burgundy colored with bold letters, in white, saying USDA CHOICE. Would you please let me know about this. @Robyn Boggs - thank you for your comment. Quality grades for meat are applied to carcasses at the processing plant by USDA graders. Based upon the information provided, the products might have been labeled incorrectly by the store employees. Mis-cuts and other mishaps can also occur during the meat cutting process, and may explain why meat is missing from one side of the steak. However, steaks may be labeled as T-bone even without any tenderloin muscle in the cut as long as the steak is cut from the area where the tenderloin muscle runs out in the loin. Under Public Law 272, USDA’s Agricultural Marketing Service conducts surveillance of meat cases in retail establishments, such as grocery stores, to ensure that USDA quality grades are not misrepresented on packages of meat. If the name and address of the store are provided to AMS (email to AskLPS@ams.usda.gov), our staff will visit the store for a compliance review. In the meanwhile, if possible, the product should be returned to the store and your concerns should be shared with store management. Excellent, short article to explain to my pork producing husband how beef is graded. As a life-long cattlewoman, it is good to see a straightforward explanation of beef. Is U S government insp same as USDA ? I think for markets to sell beef without any reference to FDA grade equivalent to is unethical. Many supermarkets are doing this these days , especially the Kroger group. Your spot on with comments about AMS. They do a great job and ensure the meats sold are marketed correctly as well as the inspectors ensuring the meat is safe and chemically free. I purchased a cut of beef from a meat market to prepare prime rib, but the cut I received is labeled Choice, and has less fat on the one side than what I see in all the pictures, nor does it have any bones in it that I can see. It is still frozen as I wasn't preparing it until New Years. What are your recommendations as to preparation. When did the inks that were used stop and now how do we know what we are paying for the shield at the meat counters? @David M Gusman - thank you for your comment. USDA meat graders still apply ink to graded meat to identify the official quality and/or yield as Prime, Choice, or Select. However, in response to consumer preference, the meat industry no longer uses the ink stamp along the entire length of the graded carcass. As the carcass is cut up, it is placed in boxes or bags that contain the appropriate USDA grade name. The packaged cuts of meat will have the USDA grade label on the outside of the box or bag. Retailers are responsible for transferring the proper grade label from the wholesaler to the retail packages. Individual retail packages may be labeled with the grade using a sticker or a sign in the meat case indicating the grade. Reviews are conducted within packing plants, retail outlets, and restaurants to verify that product marketed as USDA graded product is indeed the corresponding USDA grade. So, consumers such as yourself can be assured that you are getting what you pay for. If you ever feel like the product you are purchasing isn’t meeting a grade you can reach out to us and we will arrange a visit. I cooked a brisket that was choice I think? I have done several briskets that have come out perfect, proud to serve. The last one was great flavor and a little chewy. I'm baffled about what went wrong because I cooked it the same way as the other perfect ones before it. Should I have marinated or brined in a meat tenderizer like pineapple BEFORE smoking at 250F? Should I have just used a prime brisket? Check out the prime recipes and cooking tips. It’s practically a guarantee to make the cut next time. Jerry C. Indicates these animals are dosed with antibiotics and indicates statistics as to prove his point. He provides no backup information to support his point. @Matt - thank you for spotting that! We've updated the infographic. Great recipe ideas and good explanation on USDA. We line in a retirement community with around 500 people. We are told our meat supplier is giving us Prime beef although I question that. Is there some way we can tell if the meat is Prime? Are they required to give our food service some kind of a verifying shield or certificate? How do I know if this beef has ever been fed any feed containing pesticides or herbacides??? @Louise Stoffel - thank you for your comment. AMS grading is carried out by observing the characteristics of the carcass, without regard or knowledge of how that animal was raised. There are plenty of private companies that make claims about feeding, diet, use of antibiotics, and all those claims are evaluated by the Food Safety and Inspection Service (FSIS) on a case-by-case basis to ensure the labeling is truthful and not misleading. Diet raising claims such as “Beef fed a diet containing no pesticides or herbicides,” require specific documentation related to the claim. More information about the information needed can be found in the Animal Raising Claims Labeling Compliance Guidance at: www.fsis.usda.gov/wps/wcm/connect/6fe3cd56-6809-4239-b7a2-bccb82a30588/RaisingClaims.pdf?MOD=AJPERES. Livestock sold as organic must have been fed organic feed throughout its life. Organic feed is generally produced without the use of pesticides and herbicides, though a very small number of synthetic substances are allowed in organic agriculture. These are published in the USDA organic regulations. Didn't the grade below Choice used to be ''Good.''?? What happened to that?? Meat packers want a more appealing term?? Your article has clarified my understanding of beef grades. We have recently tried beef from a local butcher shop, Whole Foods, and a Virginia farmer. @Laura - thank you for your interest. Not all meat is officially graded for quality by USDA. The USDA Grading Service is a voluntary program, used by producers to communicate product quality to their customers. Highly trained USDA Graders assign these official grades to meat, poultry and shell egg products, and only officially graded meat can be labeled using USDA grade terminology, such as Prime, Choice, and Select for beef. If the meat has no grade designation, then it was either not officially graded by USDA or the seller opted not to label it with its official grade. If you have a concern that a retail product is being misrepresented as officially graded, our Agricultural Marketing Service can conduct a review.